Basement flooding is a common problem that affects households all over the world. While most homes are built to withstand moisture, groundwater and rain, their weatherproofing may prove ineffective after several years of exposure to the elements. When basement flooding occurs, your home sustains plenty of water damage which can have long lasting and far reaching effects. Persistent leakage or seepage in your basement can cause water damage that's not only frustrating and time consuming to get repaired, but also very expensive. If you're experiencing any amount of basement flooding, whether it's just dampness, a visible trickle, or even pooling water, it's critical that you get your basement waterproofed as soon as possible. Don't wait for the problem to spread; water today can mean rotting joists, flaking paint, rusting pipes and crumbling ceilings tomorrow. As soon as you see a sign of basement flooding in your home, it's time to make sure that your basement is completely, effectively waterproofed and the value of your home is protected. We can fix your basement flooding problem. 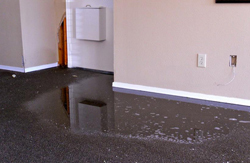 Water seepage flooding can occur in your home for a lot of different reasons. First, it's important to understand that it's natural for water to collect in the ground around your home. When your home was built, a large hole was dug in the ground to lay your foundation in. After the foundation was poured and the basement walls built up, the loose dirt that was dug up was dumped back around your walls to fill the hole in. This "back filled" soil is much looser than the soil around it, and absorbs far more water. Groundwater collecting around your home is normal because of the back filled soil, and sometimes, the persistent presence of that moisture can break down your basements waterproofing over time, causing basement flooding. Often the water that collects around your basement doesn't provide enough pressure to break the water barrier of your home, so it doesn't present a problem. When it rains or snows, though, the groundwater level rises which puts more pressure on the moisture barrier; if your basement's moisture barrier isn't strong enough, water can start to seep through cracks or seams in your wall or floor and begin to pool in low areas of your basement. Water damage that results from basement flooding can be a very serious problem. The ill effects of water on any goods that you have stored in your basement are pretty obvious, but water damage goes far beyond that. Once water breaks the moisture barrier and seeps into your home, it evaporates and considerably rises the humidity inside your house. The moist air can dampen areas of your basement and home that don't appear to be near the leak or pooling water, including carpet, furniture, ceiling panels and even the joists that support the first floor of your home. The moisture also encourages the growth if mold, mildew and fungus, the presence of which can present serious threats to your health and the health of your loved ones. It's important to take care of water damage as soon as you're aware that it's occurring. Give us a call today for a dry basement that stays dry. A waterproofed basement becomes a beautiful, comfortable, and completely usable space in your home. Not only will you be able to store anything you please in your basement without having to worry, with your new, dry basement you could easily convert the space into a lounge, bedroom or other living or common area. A properly waterproofed basement becomes a room just like any other in your house that you can put to good use and appreciate. Take care of basement flooding today, give us a call!